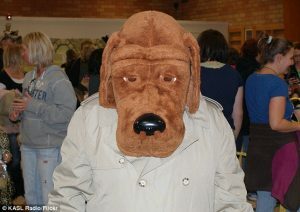 McGruff the Crime Dog Wanted for Questioning in Series of Bombings! I am fighting for my people’s freedom! Disgraced and now ball-less former crime fighter McGruff is wanted by the FBI for questioning after a series of terrorist attacks struck the heartland of America. “We are declaring McGruff, formerly known as the ‘Crime Dog’ a person of interest” said FBI director Christopher Wray. The actions of the so-called “Canine Liberation Army” threaten law and order. The CLA has conducted a series of bombings throughout our country that has left citizens afraid and local law enforcement struggling to combat the threat. We ask that McGruff voluntarily bring himself in for questioning. We seek information. That is all. As a citizen I’m sure McGruff will comply. Despite the Canine Liberation Army having declared a seize fire it is believed that McGruff heads a breakaway faction called the “Provisional Canine Liberation Army” or “PCLA” that has continued its war against the biped power structure. McGruff: How many bipeds were killed in the explosion? Lassie: We believe at least ten of their kind. McGruff: Good. Good. The bipeds must suffer for what they’ve done to me. Lassie: You mean what they’ve done to our people? McGruff: Um. Yeah that’s what I mean. They have oppressed our people. Lassie: Come on. Why are you really doing this? McGruff: I have no balls, dude. Why are you doing this? Lassie: Timmy took my stick away. And he got a cat. McGruff: This shows the ruthlessness of our biped enemy! Let’s take the bite out of the bipeds! Despite the ramping up of the PCLA’s violence many are convinced that the government is using the wrong tactics to suppress canine factionalism. “The FBI is only ensuring that more canines will become radicalized” said an advocate for closer canine-biped relations. Whenever we profile dogs or bring in dogs for questioning the resentment grows. We should be working for dialogue. The canines have many legitimate historical grievances against our kind. We all remember what happened to Dinky in National Lampoon’s Vacation. Imagine forgetting to untie your dog from the bumper before leaving the rest stop. We humans must be more sensitive to canines. A soft approach will bring many of the current canine terrorists back into our fold and have them living peacefully among us. However most are convinced that McGruff is committed to the war and cannot be reconciled. “What the hell do the humans want me to do? Sit at home and lick my balls? I would but I DON’T HAVE ANY!” McGruff said when asked if he would consent to a cease fire. Hunh. That reminds me of Samsung, the dog that mysteriously ate all those FBI texts. I thought James Comey ate all those texts?